Located approximately 28km from Wodonga and with a population of 199 people, Bethanga township is a small historic town offering beautiful landscapes and country hospitality. Bethanga was established in 1852 during the gold rush days, and mining was its primary industry. The town’s hills were full of precious metals, and in addition to gold the area mined copper, lead, silver, iron and zinc. The scenic drive to Bethanga has made the township a popular destination for today’s visitors. 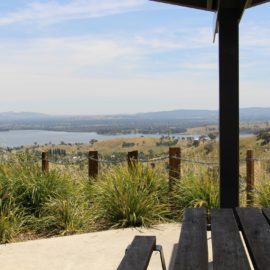 On the road between Bellbridge and Bethanga, the Kurrajong Gap Lookout offers some of the most stunning views of Lake Hume, the cities of Albury and Wodonga and the Lake Hume Dam Wall. Around Easter time, Bethanga hosts the Bethanga Gymkhana, which is a great family day out with free admission for kids. Enter yourself in one of the many competitions, or watch on and enjoy plenty of live entertainment including musicians and bush poets. Grab yourself a feed at the Bethanga Courthouse Hotel, which was built in 1838 and was originally a courthouse. Today it is a traditional country pub and offers accommodation, drinks and meals. If you are a road cyclist or motorcyclist, then Bethanga is a great stopover spot for you. Being close to Lake Hume makes Bethanga the perfect place to base yourself for easy access.